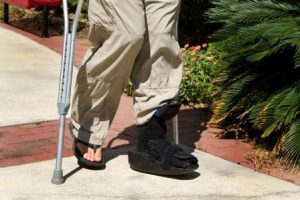 Because of a foot surgery and very slow recovery afterwards, I was temporarily disabled for five months last year. During those months of recovery, I used crutches and a cane, scooted around on a knee scooter, and/or wore a big therapeutic boot. After two weeks of elevating my foot at home and not being allowed to drive, I was finally able to venture out. It was a major eye-opener for me to witness, first-hand, what it was like to have a physical disability as a customer in a store. My experiences ran the gamut from having remarkable customer service to experiences that were really bad, whether it was a mom-and-pop shop or a big-box store. As a retailer, how do you serve or treat the disabled customers that come into your store? Those with disabilities are not able to run in and out of a business like the average Joe, so special accommodations should be made. Make sure you have courteous staff. I was at a big-box general merchandise store looking for a particular product. I asked an associate where I could find the item. I was told to follow him and away he went! This was during my big boot time so I was slow and not well-balanced. He went around a corner and I lost him. He came back a couple moments later and asked where I was. I said I was not able to go fast due to my condition and pointed at my boot. He looked at it, grunted, and walked away — I never found the item I had been looking for. I later contacted the store manager who put me in touch with the regional customer relations manager. After learning of my experience, she indicated that the store would use this as a training experience for new associates. On another occasion, I hobbled into an independent store where I am a frequent shopper. As soon as they saw me, I was kindly given a chair. The associate grabbed a shopping basket and collected the items I needed. When I checked out, the manager said if I needed anything else to just call the store and someone would run it to my house so I wouldn’t have to trek out. I was amazed at this customer service! If someone on your staff is able to hold open doors, select items, and/or help get purchases out to a vehicle, that can have a major impression on someone who can’t get around that easily — I know it certainly did for me! When looking at the interior of your store, remember to keep aisles clear of boxes, packaging, step stools, and carts. Be wary of merchandise on the floor too. I managed to take out a display pile of pillows and stuffed animals in a gift shop with my cane; it’s incredible what can happen if you get a quad cane hooked on one soft thing at the bottom of a pyramid! If there is a loading cart in an aisle, be certain that wheel locks are secure so it doesn’t move while someone is trying to get around it. The outside of your store is important as well. Make sure that ramps are not blocked and handicap parking signs are highly visible. One store I visited had one space available for disabled parking. Because the portable parking sign had been turned around to the wall and moved off to the side, a non-disabled driver had taken the spot. As there was no other place for me to park, I left and went somewhere else to shop — there wasn’t easy access to the ramp. I stopped at the store the following week and told the manager about the sign; it was corrected by the next morning. For those stores where there can be snow and ice, it is critical that the parking signs are visible. Depending on the company that plows or spreads out salt/sand, these signs are sometimes moved to prevent them from being damaged. Sometimes they are moved back and sometimes they are not. I also encountered this at two other retailers. Be careful with the granule size of the salt as well. Another location I visited used rock salt ice melt where some of the pieces were larger than a marble. While that may not seem very large, it can be very difficult for the wheels on rollators, wheelchairs, and scooters to get over. I almost went end-over-end while I was on the knee scooter; it was kind of scary. Do you have a home health care section with items on display in your store? Try using a cane, walker, rollator, or wheelchair (after hours) to go around your store and even outside; put yourself in the shoes of your disabled customers and see how you can make their shopping experiences better! It can have a tremendous impact on the customer and for your store — you get a regular customer coming back because of the exceptional service and attention to detail.